A screw conveyor is a versatile conveyor used in many process plants for the transfer of bulk solids and powders. The following article is written to enable engineers to get a basic understanding of screw conveyor design and selection of the right screw conveyor their design requirements. The first screw conveyor was designed by Archimedes, was used for the transfer of water from the hold of a ship. The screw conveyor was an internal helical screw type. The screw conveyor as mostly familiar to us these days, is of similar design to the Archimedean screw conveyor, however, the screw flight is attached to the external surface of a centre shaft, which rotates inside an external housing. In the early days screw conveyors were mostly used for the handling of grains, and are now used for the conveying of many bulk solids or powders. In recent times, shaftless screw conveyors have been used for the handling of sticky products. Some advantages of screw conveyors over other methods of conveying, is that a screw conveyor can convey material fully enclosed, and is relatively dust free. Also, screw conveyors can have multiple conveyor outlets, making discharge to multiple outlets cost effective. In addition to conveying free flow bulk solids or powders, by altering the screw flight and casing configuration, screw conveyors have versatility to condition powders and bulk solids, and are often found on process plants for this reason. The use of paddles, intermediate paddles, cut and folded flights for example allows broad type mixing of product. Heating or cooling of product is possible by jacketing of the casing. Multiple inlets can allow the mixing of additives or different products. Screw conveyors can be manufactured in lengths of up to 50 to 75m long. Long screw conveyors require a centre shaft support bearing (hanger bearing) to limit the deflection of the spiral. Shaftless screw conveyors can be manufactured up to 20 to 25m long approximately. Shaftless screw conveyors usually have the spiral supported on a sacrificial wear liner. Shaftless screw conveyors are normally used with the handling of sewage sludge, pulp and woodchips for example. The sizing of shaftless screw conveyors is usually standardised, to suit the spiral coil manufacture. The shaftless screw conveyor can be used in the vertical position, and is often used for dewatering purposes. The manufacture of the spiral in a shaftless screw conveyor is generally a high alloy steel. The following photo shows a shaftless screw conveyor dewatering filter cake. Screw conveyors can also be used as product levelling devices in certain type bunker storage, stockpiles, hoppers and in truck loading. The screw conveyor casings can be tubular, “U” trough or square. Tubular (pipe) casings are the most economical to manufacture, and are used where dust tightness is paramount, as well as being required on inclined screw conveyors. Tubular casings have the disadvantage of not allowing access to the spiral, which can become problematic in the event of accessing any blockages, and hinders inspection for spiral wear. “U” trough screw conveyor casings are usually used for process plant installations. They allow good access to the spiral for inspections, and maintenance of any hanger bearings if installed. Square screw conveyor casings are usually used where abrasive products which contain large lumps are conveyed. The square casing allows build up of product in the corners, and large lumps can push into the bed of product, without jamming the spiral - large spiral peripheral to casing clearances are also used. The spiral assembly of a screw conveyor is usually manufactured from a centre pipe, and screw flight segments. As the spiral rotates, it is subject to cyclic fatigue. It is important, to maximise the end bearing (and hanger bearing) and shaft seal life, as well as minimising cyclic fatigue on the screw conveyor drive connections, to straighten the screw spiral assembly after fabrication. Good quality fabrication and straightening of end journals to within 0.1mm of total indicated run out is required. The selection of the shaft seal on a screw conveyor depends on the particle size of the product, the abrasiveness of the product, and at times, process requirement (for example, containment of a toxic product). The range of screw conveyor end shaft seals can range from basic felt seals for grains, grease purged labyrinth seals, to stuffing box seals (which can be air or nitrogen purged). There are specialist shaft seal manufacturers that supply mechanical seals that can accommodate radial run out and axial movement that a typical screw conveyor shaft is subject to. For the handling of abrasive materials, the screw conveyor spiral assembly can be manufactured from wear resistant materials. At times, the application of special ceramics can be applied to the carrying surface of the spiral assembly. The following photo shows a spiral that is ceramic coated. Where long conveying distances are required, it is usual to have a centre support bearing to limit the screw conveyor spiral deflection. When grains or non abrasive products are conveyed, a proprietary - anti friction ball bearing hanger arrangement can be used. In the event of conveying abrasive products, combinations of hard iron or ni-hard cast bearings with hardened hanger shafts are available. Specialised ceramic suppliers can manufacture ceramic hanger bearings. It needs to be noted that at times, hanger bearings can be maintenance intensive, and contribute to noise pollution. Depending on the product, it can be more beneficial to use a “piggy back” screw conveyor arrangements to avoid the requirement of hanger bearings. Large centre tubes can also be designed to limit the spiral deflection. Screw conveyors convey material on a volumetric basis. The nominal capacity of a screw conveyor is determined by the outside diameter, inside diameter and the screw pitch, as well as the operating speed. A typical screw conveyor had a diameter to pitch ratio of 1:1 - that is, the screw pitch is the same measurement as the outside diameter of the screw pitch. For each revolution of the screw flight, a fixed volume of product is conveyed along the screw pitch length. 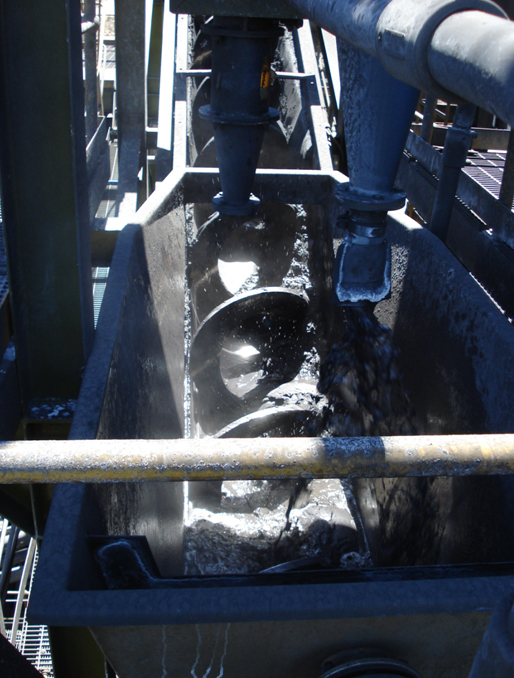 A screw conveyor requires a controlled feed of material at the inlet. Typically, a rotary valve, a preceding screw or belt conveyor / feeder is used to control feed into a screw conveyor. A screw conveyor can have alternative diameter to pitch ratios. Whilst a diameter to pitch ratio of 1:1 is suitable for horizontal conveyors, inclined screw conveyors require a reduced pitch (for example diameter to pitch ratios of 1:0.6 or 1:0.5) to overcome the inefficiency of the helix of the screw flight, at the particular operating angle. The design fill of a screw conveyor can vary, depending on the product. A screw conveyor spiral rotates at a particular speed, to maintain a fill level typically around a maximum of 45% volumetric capacity - to prevent product flow back in a “U” trough casing construction. Spiral fill levels can be as high as 80 to 90% full with the use of tubular casing, with the conveying of granular and free flowing products. However, long screw conveyors that use centre support bearings to limit the deflection of the shaft, should have a limitation of spiral fill level, at around 30% maximum, to keep the product away from the centre support bearing of the screw conveyor. The operating angle of screw conveyors can be from horizontal all the way through to vertical. The efficiency of a screw conveyor is greatly reduced from about 20 degrees onwards, and is dependant on the flight efficiency, angle of repose of the product and friction between product and casing. Inclined screw conveyors require tubular casings, and the flight efficiency is increased by reducing the pitch. A screw feeder differs in design to a screw conveyor, where the screw feeder controls the volumetric throughput of product where the screw flight control pitch is full of product - that is, the inlet of a screw feeder is 100% full loaded. The efficient screw feeder and screw conveyor design requires in depth knowledge of bulk solids and powder flow properties and characteristics, as well as detailed design knowledge of the spiral or screw flight efficiency. This is of particular importance when handling cohesive, high moisture, ideal plastic type, self aerating, and low angle of repose bulk solids and powders. Empirical “material factors” are available for the calculation of energy requirements for free flowing products, however, these factors do not allow for the effects of cohesion. Bulk solids and powder flow properties testing is considered mandatory when designing screw conveyors and screw feeders for handling difficult to manage products. The energy requirements are very dependent on the bulk solids or powder flowability properties, including cohesion and internal shear angle. It is important to note that once the product moisture exceeds around 15% (critical range for most products in general), cohesion will dramatically increase. The screw conveyor design becomes much more critical, and the generic information commonly available in various available standards is not of sufficient design capacity as such to accommodate these products. Some solutions to minimise screw conveyor and screw feeder problems when handling cohesive products is to install low friction liners in the conveyor casing to eliminate adhesion, and use a modified spiral flight design. A screw feeder hopper needs to be designed for the characteristics of the bulk solids and powder flow characteristics. Detailed consideration of the geometry and interfacing to achieve mass flow is of utmost importance. Where a screw feeder is fitted to a plane flow hopper, techniques such as variable pitch flighting and tapered centre shaft assist in the aid of uniform draw down and mass flow design. These techniques provide reasonable draw down of free flowing products. However, when handling cohesive or ideal plastic bulk solids and powders, screw feeders tend to further consolidate product, in addition to the normal gravity pressures, and can create a solid mass around the spiral. This also applies to centre-less or shaft-less type screw conveyors and feeders. Techniques such as utilising ribbon flights allows to product break away from the spiral. Low friction surfaces do assist in minimising adhesion. If screw feeders are used with cohesive products, the volumetric capacity of the screw feeder ideally should be over designed for requirements, and unreliable product flow is still to be expected. Screw Feeders handling self aerating or flushing type products once again, need to be designed to suit the hopper flow regime, without casing ratholing and uncontrollable flushing. The feeder length past the hopper must be suitable to retain the product, otherwise uncontrolled flushing will occur. The use of multiple start flighting assists in maintaining some control. When handling cohesive products, screw conveyor and screw feeder problems arise from the adhesion of product due to compaction and over consolidation of the bulk solid or powder. Remember - silo and hopper design is based on the effects of gravity. Alternative design techniques in the spiral (including ribbon flights), casing configuration and the use of liners can offer some aid in minimising the problem, and reducing energy requirements, however do not eliminate flow problems. Screw feeder problems also arise when the screw feeder affects the designed flow pattern in the silo. This can also lead to safety issues with large silos and hoppers, due to bridge collapse. The design of screw feeders requires knowledge of the consolidated bin opening pressures, as well as the full range of bulk densities - both normal bulk density and the consolidated bulk density at the design consolidation pressures.